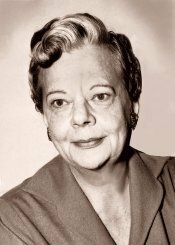 Kathleen Smith Beachy was born in Webster City, Iowa on Aug 9th, 1906.After attending private schools she found her way to California around 1939 and graduated from Redlands University. She met and married Walter F. Beachy, a research chemist. They purchased a large piece of land in the western end of the San Fernando Valley and raised a variety of crops on their farm. A home was built and Kay settled down to overseeing the ranch. Actively involved in the community Kay helped form the Southwest Civic Association. Meetings were often held at the Beachy house in Woodland Hills. One of the first problems the group addressed was the absence of sewers and flooding. Thanks to their efforts a flood channel was built. Kay's vision and persistence helped establish several public parks in the San Fernando Valley. In 1960 Kay was contacted about a developer who was making plans to build a shopping center on the exact spot where the 1844 Leonis Adobe stood. The adobe had a long and important history. By January of 1961 a successful campaign to save the adobe was gaining momentum. Plans to have the city or county convert the land to a park failed. They turned to the state, hoping to have the land turned into a state roadside inn. That also failed but Kay did not give up. In 1962 Kay had her attorney draw up articles of incorporation and formed the non-profit Leonis Adobe Association. That same year, with the help of Carl Dentzel, Director of the Southwest Museum, they formed the Cultural Heritage Board. The Board's first meeting was on August 6, 1962. It was a landmark event and a pressure-packed, memorable day. The first five Historic-Cultural Monuments declared were sites that were all considered threatened to some extent. Within three hours, the Leonis Adobe in Calabasas was designated as the city's first historic-cultural monument. Immediately upon the Board's designation, a stop work order was issued to stay the demolition of the Leonis Adobe for 360 days. At that very moment, however, bulldozers were already lined up and ready to move on the adobe. They were waiting for the final OK on the demolition permit. Knowing how critical the timing was, an "angel" in the city office noticed the permit was not complete as it lacked a signature. By the time the developer realized the mistake the demolition permit had been stopped by the Cultural Heritage Board and the adobe was saved. With no one living in the old structure, the house fell prey to vandals. Doors and shutters were ripped off their hinges, windows smashed, and the balcony broken. A favorite sport was to ride horses through the front door and out the back. Fires were set in the living room. Adobe walls were hacked so badly they were in danger of collapsing. The banister was pulled out and stuffed down the chimney. Again Kay stepped in and made arrangements to board up the house at her own expense. In 1962 Kay purchased the 5½ acres of land on which the adobe stood for $240,000. At that time Calabasas was a sleepy wide spot in the road. It's future held little potential and many felt it was not a wise financial move. Kay then gave the Leonis Adobe Association a check for an additional $40,000 to make sure the adobe would be safe and eventually restored. Kay Beachy died on October 21st 1974. She had just been appointed to the Cultural Heritage Board.